Welcome to Owl Class. My name is Michelle and I am the class teacher. Nikki is our TA2 and our teaching assistants are Sharon, Rachel and Dawn. The children are Aaban, Ethan, Hashim, Luca, Mahir, Rick-Allia, Tanisha and Zain. This half term our topic is ‘Under the Sea’. We will be learning about different sea creatures, some pupils will be able to name and label a fish; others will be sorting animals that live on land and those that live in the sea. We will have a different focus each week, with lots of fun craft activities. In English we are reading ‘Sharing a Shell’ by Julia Donaldson. The story focuses on friendship and sharing. The children will also come familiar with different sea creatures and terms such as rock pool, small, big, heavy. Pupils will continue to work on their speaking, listening, reading and writing skills linked to the story. In maths we will continue to work on the different strands of number, geometry and measure. We will incorporate ‘under the Sea’ theme by sorting colours, size, counting etc. In cooking this half term we are making biscuits. Each week we will have a different ingredient to add, oats, lemon, raisins, sea salt and caramel, chocolate chip, cherry and coconut and the last week will be up to the children to decide. The children will be encouraged to become more independent in making the biscuits each lesson. Keep checking the website for photographs. Owl Class visited Leighton Buzzard Splash Park. All of the children thoroughly enjoyed themselves, despite the weather! If the sun was shining they would happily have stayed in there all day! We enjoyed a picnic and then spent some time at the park. Take a look at our photographs and see for yourself the fun the children had. Hope everyone had a lovely Easter break. It’s hard to believe we have reached the final term of school! This half term our topic is ‘To market to market’. The focus for the topic is PSHE and Science, predominantly healthy eating and what keeps us healthy. We will be smelling, tasting and talking about different fruits and vegetables, as well as lots of arts and craft work in topic lessons. We will focus on a different colour each week, we started with green and this week is red, followed by yellow, orange, purple and finally neutral / exotic. Many of the crafts we create will be sold on our very own market stall in school which is to be held on Thursday 25th May. It will be lovely for you to come and buy some of your children’s handmade products. Owl Class are visiting The Malls Indoor Market on Thursday 27th April. In Science we have already planted some runner beans and radish seeds and talked about what plants need to grow. In English we are reading ‘The Enormous Turnip’. The children are already joining in with some of the words and actions. Pupils will continue to work on their speaking, listening, reading and writing skills linked to the story. In maths we will continue to work on the different strands of number, geometry and measure. We will incorporate the fruits and vegetables by sorting colours, size, counting etc. In cooking this half term we are making pastries and pies. Each week we will have a different main ingredient for the pie related to the colour of the week. The children will be encouraged to become more independent in making the pastry each lesson. For any other information or question's you may have please contact me in the home-school books. Welcome back everyone and I hope you had a good week off. 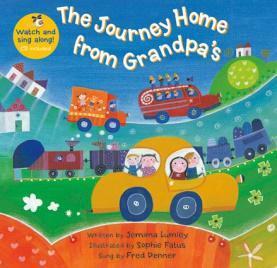 This half term we will be reading the story ‘The Journey Home from Grandpa’s’ by Jemima Lumley. The story begins in a yellow car and you come across lots of other forms of transportation on the way home from Grandpa's. There’s a beautiful, double-page spread at the end which features all of the colours and modes of transportation from the story. Pupils will continue to work on their speaking, listening, reading and writing skills linked to the story. There is a lovely sing-along version of the story which the children are thoroughly enjoying. In Maths we will continue to work on the areas of number, geometry and measure. Keep looking at our web page and reading the home/school book to find out which strand we will be covering each week. Our Topic this half term is ‘we all travelling by’ and each week we will be looking at a different method of travelling. We start off looking at construction vehicles, followed by bike, car, bus, train and boat. We have a trip planned to Stockwood Park to look at the vehicles in the museum. During car week we are planning on the children washing our cars! In cooking this half term we are making cupcakes. Each week we will add a different ingredient. The children add and mix the ingredients and will be encouraged to become more independent each week. We welcome 2 new pupils Rick-Allia and Zain and a new TA called Rachel to Owl Class. This half term in English we will be reading the story of ‘The Gruffalo’ by Julia Donaldson. This is a rhyming story of a mouse and a ‘Gruffalo’. Little mouse goes for a walk in a forest. To scare off his enemies he invents tales of a fantastical creature called the Gruffalo. So imagine his surprise when he meets the real Gruffalo. Pupils will work on their speaking, listening, reading and writing skills linked to the story. In Maths we will continue to work on the areas of number, geometry and measure. Keep looking at our webpage and reading the home school book to find out which strand we will be covering each week. Our Topic for the next 5 weeks is entitled ‘There’s no such thing as a Gruffalo’. We will be looking at different types of animals each week. Week 1 we will cover mammals, week 2 is birds, week 3 is insects and reptiles, week 4 is plants and week 5 is amphibians and fish. There will be an art and science focus to our lessons looking at the different animals and their habitats. In cooking this half term we are making pizza. Each week we will make the dough and add a different topping. The children will grate cheese and practice their cutting skills by cutting the toppings for the pizza. By repeating the same skills, the idea is that the children will become more independent each week in making a pizza and making choices of their favoured / chosen topping. This term our topic is ‘Where is Bear?’ We are following our bear (called Benny) around the world to different Countries where we will be finding out a little bit about that country and culture, creating art work and cooking foods based on that country. In the first week we celebrated Diwali. ‘Benny Bear’ visited India and we looked at photographs of where he visited, decorated the Indian flag, completed a rangoli pattern using coloured rice and made naan bread in cooking. All pupils within the year band took part in a ‘Diwali carousal’; exploring activities in different classes, including food tasting, sensory stories, made diva lamps and created rangoli patterns. In week two Benny Bear visited Poland; the pupils decorated the Polish flag and made a poppy. We also attempted their traditional folk dance! Over the next few weeks Benny Bear will be flying to China, Italy, France and back to England to visit some of our local areas. the children love watching it and joining in with some of the actions and words. For the next four weeks each year band are reading a traditional tale. We will be reading ‘Hansel and Gretel’. Within our literacy lessons, we will continue to cover drama, speaking and listening skills, mark making /writing and sequencing. The children have settled in brilliantly, and it's hard to believe that we are already starting the fourth week of term! Our topic is called ‘The Things People do’ and each week we will be looking at different jobs people do. The first week we got the children familiar with the new school and staff. Week 2 was all about doctors and nurses. We had a nurse come and visit our school and spend time with the children in our role play room. Last week was all about ‘chefs’ and the role play room was set up as a restaurant. We dressed up and acted being a chef, made a chef’s hat and completed lots of sensory play. This week we will be looking at ‘hairdressers’, followed by a week of ‘postman / woman’, followed by ‘fire / police’ and we will end the term with ‘shop’ workers. As mentioned, lots of role play will be carried out as well as classroom based activities. Literacy – Our main story this half term is ‘We’re Going on a Bear Hunt’ by Michael Rosen. The children love this repetitive story and they are already joining in with words, phrases and signs. We have been ‘singing’ the song version of the story which we all enjoy. Pupils will work on their speaking, listening, reading and writing skills linked to the text. In addition we will be learning phonics and this helps the children's speaking and listening as well as reading and writing. In maths we will be covering the areas of number, geometry and measure. Keep looking at our webpage and reading the home school book to find out which strand we will be covering each week. I will update the page regularly with pictures of the children enjoying their learning, so please check the website regularly. If you have any questions please do not hesitate to write in the home/school book.